ABU DHABI, (UrduPoint / Pakistan Point News / WAM - 16th Apr, 2019) H.H. 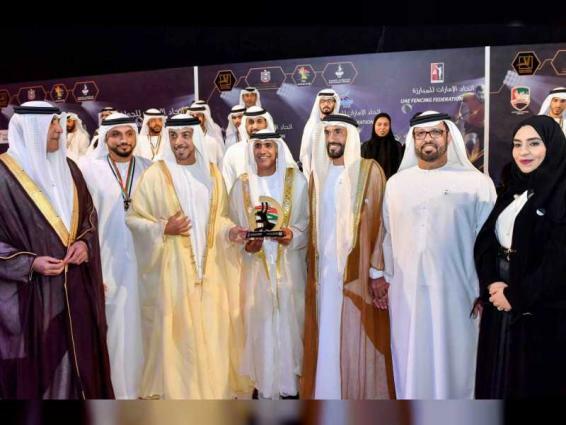 Sheikh Mansour bin Zayed Al Nahyan, Deputy Prime Minister and Minister of Presidential Affairs, has honoured the UAE’s sporting champions in 2018, during the 13th annual celebration organised by the General Authority of Youth and Sports Welfare, GAYSW, at Mubadala Arena in Abu Dhabi. During the ceremony, Sheikh Mansour bin Zayed honoured H.H. Sheikh Nahyan bin Zayed Al Nahyan, Chairman of the board of Trustees of Zayed bin Sultan Al Nahyan Charitable and Humanitarian Foundation, who was awarded the 'Sports Figure of the Year 2018', among other sporting federations and instituions who were recognised for their efforts in bolstering the UAE sport sector. Mohammed Khalfan Al Rumaithi, Chairman of the GAYSW, said that the initiative launched by President His Highness Sheikh Khalifa bin Zayed Al Nahyan, confirms his keenness to support athletes and promote their excellence, and reflects his vision and support for sports in the UAE. He then thanked the Vice President, Prime Minister and Ruler of Dubai, His Highness Sheikh Mohammed bin Rashid Al Maktoum, who is a model to follow of successful leadership, due to his efforts to serve the country over 50 years and help it reach the highest of positions. Al Rumaithi also thanked His Highness Sheikh Mohamed bin Zayed Al Nahyan, Crown Prince of Abu Dhabi and Deputy Supreme Commander of the UAE Armed Forces, and Their Highnesses Supreme Council Members and Rulers of the Emirates for supporting sports in the country, as well as Sheikh Mansour for his keenness to support the ceremony on an annual basis and honour Emirati sporting champions.